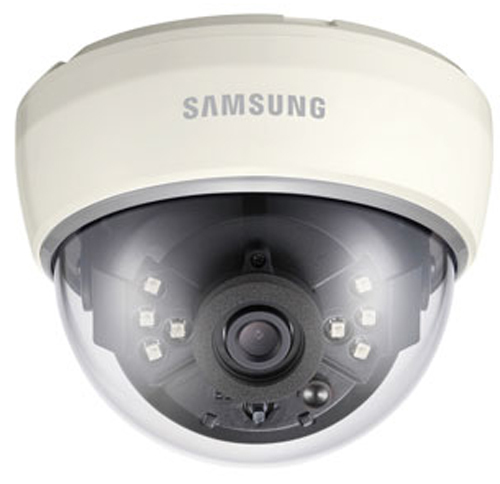 The Samsung SCD-2020R is a fixed analog camera that offers 600 lines color and 7m of IR distance. This camera is equipped with a 3.6mm built-in fixed lens and 16x digital zoom, for precise monitoring. A minimum illumination of 0 lux makes the camera suitable for nighttime surveillance. It features SSDR (Samsung Super Dynamic Range) that balances the overall brightness by illuminating the darker areas to the same ratio as the bright areas, and produces clear images under high-contrast lighting conditions. The high-resolution camera with Day/Night ICR function switches between color and B&W as per changes in ambient lighting, ensuring accurate color reproduction in daylight and enhanced B&W images at night. Gain control adjusts the signal strength to maintain a constant brightness level, and auto white balance adjusts the red and blue signals by taking a standard white color reference to get the most natural colors. The Samsung SCD-2020R has many exciting features for users of all types. See the Samsung SCD-2020R gallery images above for more product views. The Samsung SCD-2020R is sold as a Brand New Unopened Item.